Truth by Kbaig: Attention… The King of World’s Visit to India…!!! Attention… The King of World’s Visit to India…!!! Fifth administrator of New World Order, King of World, his highness President of America Mr. Barrack Hussein Obama is about to departure for India. 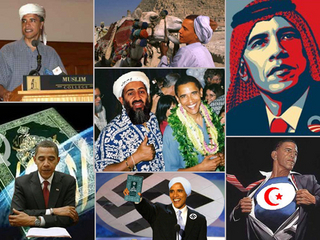 He is the same person on whose selection as President Islamic world got pleased. Liberal and moderate writers were of the view that now the sorrows and pains of Muslim Umma will be decreased. This is another matter that Mr. Obama having Islamic identity only limited to his name was introduced politically that “if he takes over as American President he will spare even to bombard holy city Makkah”. Now when he is preparing for an important visit to South Asia his hands are also red with innocent Muslims blood like ex-US President. It is the miracle of that innocent blood that as soon as announcement of Obama’s visit has been made Indian rupee has improved 40 paisa with respect to US Dollar. And economists say in the result of a successful visit Indian rupee will improve more and Indians are happy over it. Contrary to this every patriot Pakistani is worried that if like David Cameroon, if Mr. Obama also threatens Pakistan to please India then what will happen? 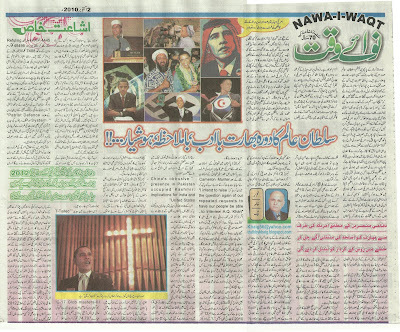 What will be effects of negative role of American President against Pakistan? In spite of this truth that from last decade Pakistan has to bear much loss for being front line ally of America and it is still continued. When representative of trader English nation threatened Pakistan in New Delhi with his address to Indian investors he was only under the pressure of deteriorating Britain economy. He wanted to please India to make deal of 126 fighter aircrafts so that British govt. can earn its livelihood. While American Obama is not only blamed for supporting Muslims but also giving more importance to Pakistan in comparison to India. Look at the record of past two years in international print media you will see Indian and European media same rhetoric that America should attack Pakistan for international peace. 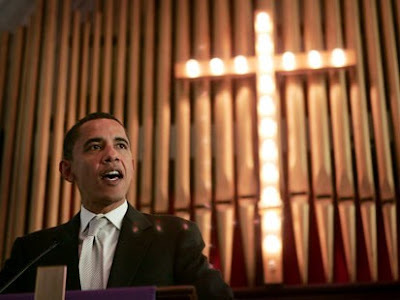 Moreover due to severe criticism from Republican and opposition Obama has to go to church and announce that “he is a Committed Christian”. And moreover Obama is also afraid of defeat in the hands of Republican in upcoming elections of Congress. Obama can use pro-Indian Lobby in American senate to help Obama and Democratic Party. 1. Held/Occupied Kashmir: this reality is now accepted by Indian intellectuals that India has intentionally created such situation that due to which Kashmiris are now not willing to accept anything less then freedom. After partition whatever promises were made by India to Kashmiris have not been fulfilled. But India has tried to crush freedom movement through military and power. In this situation it is expected that if America repeated its stance that Kashmir is internal matter of India then upcoming days will be full of human rights violations and torture for Kashmiris and genocide. There is only one way to avoid this OIC should come forward and not only brief UNO but Washington as well that if they did not play their role in Kashmir like Palestine then there will be uncountable life losses and South Asia may go to Nuclear War. 2. Punishment of Dr. Aafia Sidiqui from “Free Court of America”: in spite of weak proofs, mutilated truth and in spite of her being a woman the decision of her case has been made. Analyze it with reference to disclosures on WikiLeaks about American war crimes, statements of American Generals and Politicians that in this way life of American and European soldiers will be threatened in Afghanistan. Have not they challenged Muslim Ummah by punishing Dr. Aafia or have Taliban accepted that verdict of court? It is clear that under cover of this decision America wants to make such a deal by taking benefit of emotional situation in Pakistan on which otherwise Pakistan will not agree. And after Obama’s visit to India the pressure on Pakistan will increase manifolds. 3. after deployment in Pakistan the statement of new American ambassador: after orders from Obama the new ambassador to Pakistan Cameron Munter astonished everyone on Press conference by saying, “I intend to raise the question again of our repeated requests to have our people to interview Dr. A.Q. Khan”. If access to Dr. A.Q. Khan is mandate of new American ambassador then take in contrast to Dr. Aafia’s mother’s statement that, “for freedom of Aafia the deal of exchange of American arrestees will be a poison for Pakistan. I will not sell my country for my daughter. If that deal is made than we will have to handover many notables including Dr. A.Q. Khan”. Who will be the other notables it is unknown but in the way Hilary Clinton and other officials have taken that stand that this is the only way of Dr. Aafia’s freedom this supports concerns of Dr. Aafia’s Mother. 4. Indian Propaganda of China’s Presence in Northern Areas of Pakistan: India is claiming from last two months that Chinese Army is present in Gilgit, Bilitistan in response to this Pakistan's Foreign Ministry has rejected Indian claim. However on 13th December director of Indian secret agency RAW “Retd. Brigadier” and chief of Indian defense think tank Dr. Subhash Kapela” has published an article in American newspapers with title; “China’s Obtrusive Presence in Pakistan Occupied Kashmir: Implications for India and United States”. Moreover propaganda going-on in Indian media that growing ties between Pakistan and China are not in favor of Indian and American interests. And now Pakistan is not front line ally of America but China. After such like statements vice ambassador of China to Pakistan has cleared to the world through press conference that presence of Chinese in Gilgit and Biltistan is for repairing bridges and roads which were built by China and they are destroyed in current rains. Apparently Indian propaganda against Pak-China friendship is limited to its own interests but America has been using India for its interests since long time. And supply of latest cargo aircrafts is also part of this chain. Definitely in New Delhi this will be discussed with the American President. 5. Attack of NATO forces within Pakistani boundaries: on 27th of September occupying forces of Afghanistan broke into Pakistani territory on two Helicopters. When Pakistan protested against this first time the NATO officials in Afghanistan rejected Pakistani protest and took stance that they are allowed to follow terrorists within Pakistani territory. For this a deal with Pakistan for entering within few miles of Pakistani territory is present. When this deal was made, who signed it? Pakistani people are ignorant of it and take NATO’s activity as attack over Pakistani Sovereignty. Moreover this threat is also been showed that if India also did such like activity then govt. which is already entangled in political crises how will it deal with it. President Obama announcing in the Chuirch that he is a "Commited Christian"
Readers in our country it is not Marshal Law but democratic govt. At least at such time this is the duty of our leadership that they forget their mutual disputes and political interests to show solidarity as a Pakistani and should make it clear that their attacks and drone attacks are spreading terrorism and creating terrorists within Pakistan. This will not be accepted by Pakistani nation anymore. I think that the purpose of such attacks is to make tribal areas to attack NATO forces as a reaction so that America, NATO and Hamid Qarzai can get some ground reason to attack Pakistan. Now let us come towards the purposes for which American President is going for pilgrimage to India. In this deal/visit “T-Tailed C-17 Glob Masters-III” cargo planes are given special importance, whose training flights have been recently completed. These planes can fly up to 4445 Kilometers without needing refueling carrying a weight of 74797 Kgs and 7408 kilometers carrying weight of 45495 Kgs. According to Russian newspaper “Moscow Time” the purpose of supply of these cargo planes to Indian airforce should be analyzed with respect Indian role in Afghanistan in upcoming years otherwise India doesn’t need these planes. Moreover through these planes India will be able to supply weapons to Arunachal Paradesh, Tibet and Ladakh in any possible war with China. In addition to these cargo planes, “Patriot Defense System” and Artillery Guns of different types are also included in the list demanded by India. These guns are only given to US and Israeli forces.